"41MR12, Burial II, 103" by Timothy K. Perttula and Robert Z. Selden Jr.
DECORATION: The vessel body has an appliqued design consisting of alternating diamonds and hooked arm scrolls. Within each appliqued diamond is a small punctated appliqued circle. 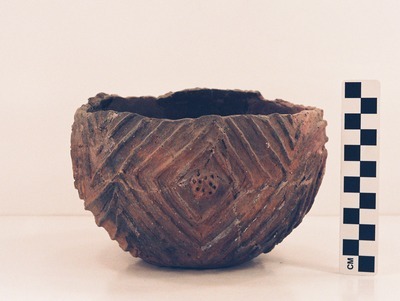 Harleton Appliqued jar (MR12-103) from Burial II at the Ben McKinney site.